Managing files on computer is very basic and important routine. We tend to deal with different type of files like images, videos, programs etc. Renaming multiple files at once saves lot of time and effort while managing files on the computer. You can either use Windows trick or free utility for easy multiple file renaming. Say you want to rename multiple image files at once. Select all files using mouse (or hold shift key and click each image file). 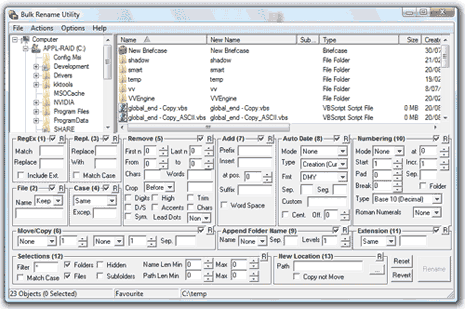 Then press F2 key for renaming or right click on selected files and click rename option. Enter Filename like “File”, all other files will be renamed in same sequence like file, file(1), file(2) and so on. You can use either of following software utilities for quick and easy renaming of multiple files. 1. Bulk Rename Utility – It can rename files and entire folders based upon extremely flexible criteria. It allows you to add, replace, insert text, convert case, add numbers to the file names. Works fine with all type of files including image and mp3 audio files. 2. Rename Master – Another free and easy to use utility for renaming large number of files quickly. It helps you add, remove or replace specific parts of the filename support renaming of mp3, jpeg and other type of files. 3. All File Renamer – It allows you to rename multiple files and folders quickly in batch mode. It can rename mp3 files from ID3 tags, sort files, move them to folders and much more. Which utility or trick do you use to batch rename multiple files at once? Rename Master download page will not allow you to download if your browser blocks his ads. Seems like he’s trying to hold downloaders hostage so that he can earn his click through pennies. No thanks.